The Auditori is one of the most recent musical epicentres of Barcelona and an important focal point for music lovers of the city. Located beside the TNC and Plaça de les Glòries Catalanes, the Barcelona Auditori offers a wide range of musical culture throughout the year, together with education and enjoyment for everyone wanting to delve into the world of music. 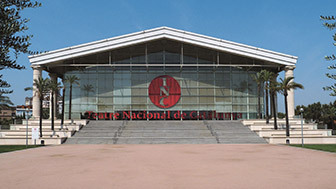 Located on the right side of the Eixample district, the Barcelona Auditori forms part of the cultural complex which spreads around Plaça de les Glòries Catalanes, beside the Teatre Nacional de Catalunya and the three most important roads in the city: Gran Via, Diagonal and Avinguda Meridiana. It is one of the most important musical institutions in Barcelona and Catalonia, as it aims to offer its own musical project for everyone. It is home to the Orquestra Simfònica de Barcelona i Nacional de Catalunya, the Banda Municipal de Barcelona, and also to the Museu de la Música. Designed by the architect Rafael Moneo and opened in 1999, the Auditori building encompasses three halls: Pau Casals, Oriol Martorell and Tete Montoliu, all with different capacities and all studied acoustically by the specialist engineer Higini Arau. Within its plain modernity , one of the distinctive features of the building is the central entrance foyer, where a monumental cubic glass lantern has been constructed in an impluvium shape, decorated with striped paintings by Pablo Palazuelo. An important function of the Auditori is education, so it also houses a music school, the Escola Superior de Música de Catalunya,along with a musical education programme addressed to families and children, for them to learn and enjoy the musical art. 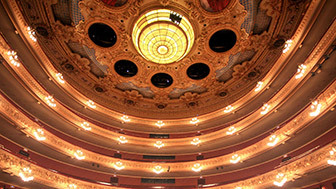 The focus of opera, ballet and classical music in Barcelona. The emblematic TNC is a meeting point for both national and international culture.